* What works, what doesn't. 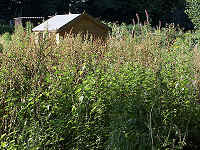 Are you breaking in a new garden or clearing up a wild weedy patch. It's tempting to use weed killer. But to stay organic you need to consider the alternatives to weed killer. So here's some information about reclaiming those wild plots that have been taken over by perennial weeds and trees. There's actually a range of organic weed controls here for you to use. You'll find more about the nature of perennial weeds here, but for practical approaches to clearing new ground see below. Of course you will need to balance the size of the job with the number of hands you have to work and the time you have. Sometimes it can be a daunting task. But weed killer can be expensive, especially on larger areas. And of course - weed killers are poisonous. There are two approaches if your ground is going to take some time to clear. 1 Do smaller manageable pieces: Keep at it, give yourself a pat on the back when a piece is done - you'll eventually get there - see below for help. 2 A fast track mechanised approach: Perhaps you want to use a garden tiller to break in a new plot. You'll find more about garden tillers and what they do on this link. A thriving site - And there are worse things. First you need to remove any debris from the site - building rubble and rubbish. Then cut the weeds down to the ground. - or a sharp spade - (because densely weedy ground is often dry, roots snag a fork & tap rooted weeds e.g. docks & thistles, are best dug up whole). Weed barriers may need to be left in place for 6 months to 3 years. After that they should be removed so that your ground can be improved organically. edging the surround and covering with compost. The weed barrier is a temporary solution and you will look forward to laying out and cultivating permanent beds for your flowers, vegetables and herbs. But first it takes no time to slash the weeds to the ground & cover with a light excluding permeable sheet. If your patch is overrun with briers and thorn then your ordinary gardening clothes may be torn to shreds. But you can prepare yourself with the tough gloves and rip resistant clothes on these links. Increased shade and drier conditions usually leave wooded areas free of the usual weeds. That may change when a wood is cleared. Resist the temptation to clear established woodland where it provides valuable wildlife habitat. But if you have an overgrown orchard or an area where ornamental or fruit trees have spread by underground suckers then, clearing it up can be quite a challenge. You should not cut off the trees at ground level, but leave a good length to help you grip and lever them out of the ground. Rope may also be useful. You'll find garden tools from this link. There are materials that kill weeds that are natural. They are not chemically synthesised herbicides. You can find these on my pages about natural weed prevention, and organic weed killer. What You Need To Clear Weeds For Your Organic Garden. Protect your hands from thorns with the Tough Touch Leather Gauntlets on this link. The Bionic Garden Gloves on this link are designed for mobility, comfort and protection. These Gardening Clothes make you look and feel good while you're gardening. And this link to the same site contains a vast range of gardening footwear. Use Heavy Duty Weed Control Fabric to go under gravel. Lighter fabrics are also available here. But they are harder to handle on a windy day. Find out how to lay sheet mulch on the-organic-gardener.com. For the fast track find my links to mechanised rotavators, rotary mowers, and scythes here. And you'll also find a nice range of different sized gardening Boots and garden Clogs all here for you. Choose these Weed Barriers for growing fruit and vegetables. and get $20 FREE off your first order at Gardens Alive. Use Heavy Duty Weed Control Fabric - Roc Kloth to go under gravel. Lighter fabrics are also available here (with organic controls). But they are harder to handle on a windy day.